Welcome to our comparison guide between Linksys Velop Vs Netgear Orbi Wifi Mesh Systems. These systems are currently two of the top-line wireless technologies and many people are wondering which one is the best for their home, so we’ll try to help you out in this article. If you are tired of slow internet or reduced wireless coverage due to using the wrong WiFi devices or because your home is too big for just one WiFi router, then it’s about time that you invest in a WiFi mesh network system which covers wider areas and is much more reliable than a single WiFi device. Before the mesh networks were introduced to the world, people relied upon simple routers and often suffered slow network and dead spots because of weaker signals even in short ranges. Mesh networks allow you to extend your wireless signal coverage by placing additional devices (WiFi nodes) around your home thus creating an “umbrella” (mesh) network. Each wireless device communicates with the other nodes seamlessly and provides full WiFi speed and connectivity around its area. Setup of mesh wireless systems is quite easy, and they do not require any wiring between the nodes. It means that there’s no need to worry about rewiring your house or relying on the previously installed old wire networks. Also, the mesh network is viewed as a single network (one SSID) from all of your WiFi connected devices (smartphones, laptops etc) without having to login to different routers and without any interruptions even if you are moving around the house. Let’s see a quick comparison of the two products before moving on with more detailed descriptions. Below we are showing a side-by-side comparison table of the most important features to get a quick idea of the differences between the two systems. A mesh wireless device, the Linksys Velop, promises solid and fast connection throughout your house. The developers of Linksys Velop have done an amazing job when it comes to the range and speed of this product. This is a true mesh system since all Velop nodes communicate directly with all other nodes in the network. You just need to connect one of the nodes to your ISP modem/router or you can even configure one of the Velop nodes to act as the ISP router for connecting to the Internet (using PPPoE for example). WiFi Speed: 2200 Mbps (theoretical maximum) for an AC2200 model. 2.4 GHz Radio Frequency (802.11b/g/n), 5 GHz Radio Frequency (802.11 n/ac). Seamless roaming technology (all nodes form a single mesh network). 2,000 sq. ft. per node coverage (add nodes for more coverage). Access to advanced features via Linksys Velop mobile app – parental controls, beta level Bride mode, device prioritization, VPN pass-through support, wireless MAC filtering, guest access etc. 3-year warranty and 24×7 reliable support. No web-based management (only via the mobile App). More expensive compared to similar products. Only 1 LAN Ethernet port for wired connections. No USB port for connecting external devices. Can’t be mounted on wall or ceiling. WiFi speed performance is much lower compared to Netgear Orbi (based on independent tests). Linksys uses the new 802.11ac industry’s leading technology known as BeamForming. While older Wi-Fi systems usually broadcast everywhere, BeamForming scans the overall area and focuses on the spot where a device is connected to the signal. Apart from that, the feature of device prioritization makes sure that your favorite device receives the best connection as compared to rest of the connected devices. You can add a total of 3 devices on the priority list. Another extraordinary thing about Linksys Velop is that your gadget will connect to the nearest node’s signal automatically, without any need to sign in again. That is one of the many reasons why Wi-Fi mesh systems are better than simple routers or wifi repeaters. The absence of a USB port means that connecting a portable USB hard disk for data back-up is out of the question. You also can’t connect with other gadgets like cameras, printers etc. Moreover, having only 1 LAN port limits your to the number of wired devices that you can connect to the home network. For those people with Smart Homes, this mesh wifi system will be an awesome network to invest in your money as it works perfectly with Alexa, features Bluetooth communication and is bolstered by the Linksys Smartphone App. Although it costs a lot, it has some amazing features like parental control, speed test, guest access, and many others which make its usage much easier. You can even ask Alexa to switch on the guest network or remind you about the guest network name and password. Netgear Orbi is a revolutionary wifi system which not only features a dedicated backhaul wireless band (5Ghz with 1.7 Gbps link speed) between the nodes but also a USB port to connect directly to external peripheral devices like scanners, printers, office equipment etc. Each unit has also 4 LAN Ethernet ports (3 ports on the central Router unit) for wired connections of other home electronics (smartTV, video streaming player, game consoles etc). Moreover, firmware Version 2.1.1.16 and later supports also Ethernet wired backhaul as well (in addition to wireless backhaul). Initially, Orbi’s positioning was a little bit different compared with other true mesh wifi systems. The product was not considered a true mesh system but rather a Star-topology network (hub-and-spoke). In a Star-topology network there is one central Router node and the other devices are Satellite nodes (called “extensions”) connected to the central Router node. However, with a recent firmware update, the Satellite nodes can now communicate directly with the other Satellite nodes (in addition to the base Router node) thus forming a mesh network like other brands. Another important point to consider is that the base Router Orbi node does not include an internal modem so you must have an ISP modem/router in place to connect the Orbi to it for Internet access (just like the Velop model). The only exception is the CBK40 model which includes an embedded Cable Modem (DOCSIS 3.0). This means that you can get rid of your existing ISP cable model and save on rental cost. Its compatible with Xfinity from Comcast, Spectrum, Cox, and more. As you can see from the diagram above, the Orbi Router unit is connected to the ISP modem/router with an Ethernet cable. The Orbi Satellite units are then connected to the Orbi Router with WiFi backhaul (or with wired backhaul if you want). 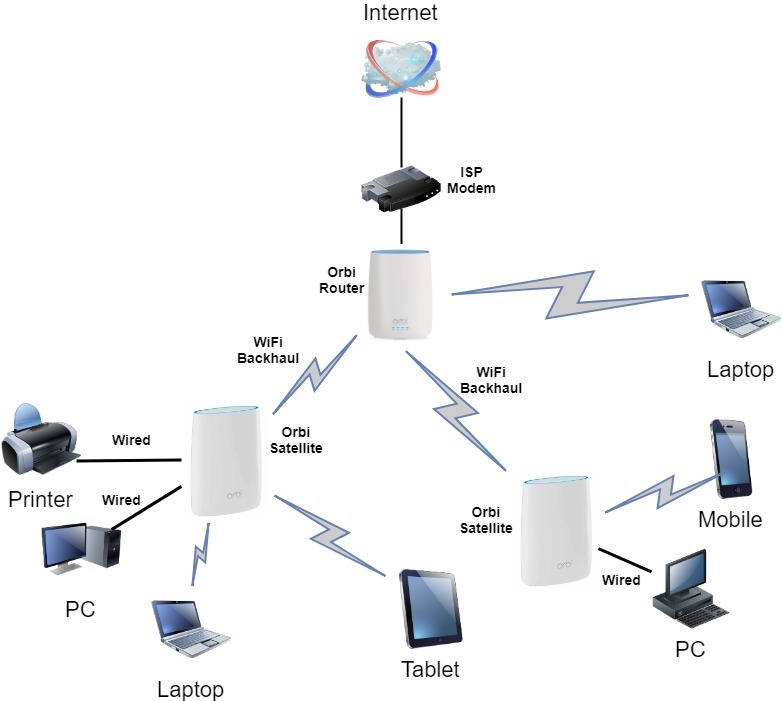 All devices in your home (laptops, PC, tablets, smartphones, printers etc) can be connected to either the Router or Satellite units using WiFi connectivity or using Wired Ethernet cables connected to the included LAN network ports of the Orbi devices. Combined WiFi Speed: 3,000 Mbps (1733 + 866 + 400 Mbps) (theoretical maximum). Supports any ISP provider (needs to have an external ISP modem/router to connect with). Router Node: 1 WAN Ethernet + 3 LAN Ethernet ports (Gigabit speed). Satellite Node (extender): 4 LAN Ethernet ports (Gigabit speed). USB port on each node. Alexa Integration and Google Assistant integration. 2.4 GHz Radio Frequency (802.11b/g/n), 5 GHz Radio Frequency (802.11 ac). Seamless roaming technology (all nodes form a single mesh network with one WiFi name). MU-MIMO technology and Beamforming (via the 802.11ac wifi standard). Supports management and configuration via both Web based access and Mobile App-based setup. 1,500, 2,000, 2,500 sq. ft. add-on satellite nodes for extra coverage. Access to advanced features such as guest network, device prioritization, parental control, access filtering, VPN, port forwarding etc. Much Faster WiFi speed performance when compared to Velop (based on numerous independent tests). Dedicated backhaul link at 5Ghz with 1.7 Gbps speed for connecting the satellites to the main router node. Easy management using both web browser (from your laptop) or mobile app. Included USB port is very handy for connecting peripheral devices (such as portable hard disk). Additional Gigabit Ethernet ports are very useful to connect computers, smart TVs etc to the network. Single name WiFi SSID provides easier connectivity management. Only 1-year warranty and 3-months of tech support. No built-in ISP modem (you must connect to an existing ISP modem/router). Netgear Orbi makes sure that every area of your home receives good Wi-Fi coverage, hence it is also known as the “Orbi the Wi-Fi Blanket”. This mesh system comes along with the main router which is even larger than the two satellite nodes, make the design a little larger and bulkier than other brands. This is where Orbi failed against Luma, Google WiFi and Eero, in designing a compact system. However, one must see the performance and features offered as first priority and then consider the design in our opinion. The 2-pack RBK50 system is the most popular one and covers the needs of most home owners (up to 5000 sq.ft). Selecting also a less costly add-on satellite (like the RBW30) you can add WiFi coverage by extra 1500 sq.ft without increasing the price too much. Working on the foundation of Beamforming, which allows you to set a priority for connectivity of your favorite devices, makes it a very efficient wireless system to cover the needs of every situation. Netgear Orbi allows you to set only one Wi-Fi name (SSID) and does not have the ability to differentiate which node’s signal you are using. This makes it easier for users to connect to the network compared to other systems. The incorporated USB port gives it an advantage over Linksys Velop since you can now connect peripheral devices like printers, USB hard-disk etc and share them over the wireless network. This brand is a tri-and-stream (2×2) router which comes with a dedicated backhaul. Dedicated backhaul provides you an additional 5GHz band apart from the primary 2.4 GHz and 5GHz. This additional band is for communication between the router and satellites. This implies the primary bands are only required for transmitting data between your devices and Orbi thus leaving the dedicated wireless backhaul link for connection between satellites and router. The outcome is fast and solid Wi-Fi signals which prevents the bands from getting overloaded. That’s one of the reasons the Orbi system is much faster than the Linksys Velop (some independent tests showed Orbi to be 34% faster than Velop). Let’s take a look at both of the products discussed above and compare them under the light of various aspects to see whether the difference in price between the two mesh kits is justifiable or not. Let’s first see the main similarities between the two systems. This is an extremely cool component of both of the WiFi mesh systems. 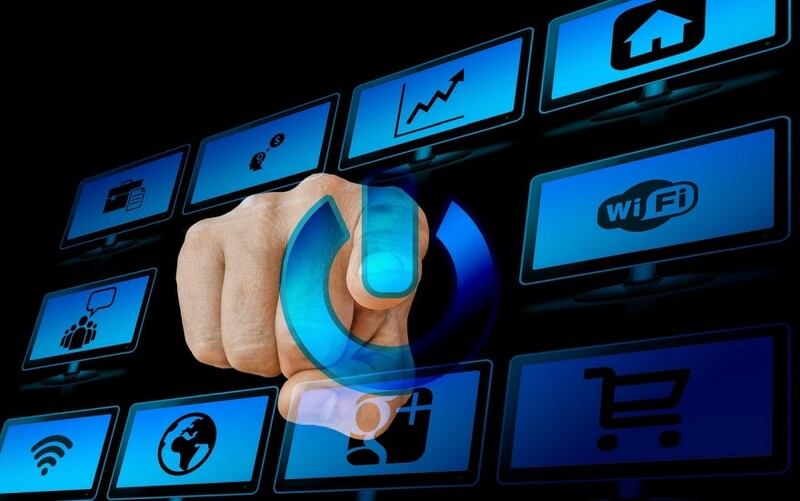 Device prioritization plays its role where there are some devices which require the best WiFi signal strength to operate at optimum conditions. It is a feature which allows you to set various devices as priority so that they have the best internet connection strength. So, what the software does is that it performs some calculation and allocates better signal strength to some particular devices on the priority list. Both Velop and Orbi come with this feature, however, from user experience, Velop’s is a little better. To begin with, it is quite easy to set-up and you can add up to 3 devices in the priority list. For Smart Homeowners, Alexa, of course, is the top in priority. Both systems can integrate with Amazon’s Alexa. Orbi however connects also with Google Assistant as well. The integration is basic though. For example you can switch the guest network on/off, ask Alexa to tell you the guest network password etc. There are a lot of additional features that these systems offer, so let’s have a look at them too. We will first begin with Guest Access. It allows you to create a separate temporary network for your guests so that your primary network is not overloaded and also you won’t have to give the password of your main wireless zone to guests. Then there’s Parental Control which enables guardians to monitor their kids’ activity on the web. Another cool feature is Beam Forming, a top-notch technology which scans your whole house and concentrates the signals on those devices which are connected to the Wi-Fi, instead of simply broadcasting the signals. It is available in both models. MU-MIMO is another feature present in both of the systems. It is a progressive wireless communication technology that enables a router to communicate with numerous devices at the same time. This technology helps to boost the network by reducing the waiting time for a device for signal reception. It is quite difficult to compare the speed performance of one with the other because the conditions vary from home to home. However, there are several independent tests online which show the speed performance on Netgear Orbi to be far superior to that of Linksys Velop. This is an extremely crucial area of discussion, considering that connectivity is among the main aspects to consider when purchasing a mesh system. Connectivity can be viewed from two different angles – hardware and software. Linksys Velop features two Ethernet ports, one for LAN and the other for WAN. It gigantically lacks on the feature of a USB, which is the reason why Netgear Orbi has received a famous spot in the business world with the “Netgear Orbi for Business”. While main input for Linksys Velop is the LAN, you can directly make a connection between an external device and Orbi through the USB port in addition to LAN wired port. Also, Orbi comes with 4 LAN Ethernet ports and 1 WAN port (the one connected to the existing internet router), while the rest for making connections with the LAN-enabled devices, such as TVs, printers, scanners, consoles, etc. If you consider the hardware input/output, then Orbi wins the day. The data link protocols for both the mesh systems are the same. You can connect utilizing Ethernet, Gigabit Ethernet IEEE 802.11a, IEEE 802.11b, IEEE 802.11ac, IEEE 802.11g and furthermore IEEE 802.11n. While Orbi misses out on Bluetooth, Velop tops with this feature included (for management purposes). It all comes down to personal preferences and choosing the mesh system which suits your needs better. Although the Linksys Velop is still an excellent choice, our recommendation when comparing Velop Vs Orbi is to go with Netgear Orbi. There are some crucial features and performance statistics that Orbi wins over Velop hands down. Dedicated backhaul between nodes (both wireless and wired), much faster speed performance, USB port etc are some of the important features of Orbi that make it a better choice compared to Velop in our opinion. Hi, can you let me know what you think about whether the Orbi or the Velop would be the best product for me? I have read that the Orbi needs to be placed in the centre of the home but I can’t do that as my main router is in the front corner of the house. In between that and the main daily living area (which is on a ground floor extension) there are some brick walls and more than one steel RSJs. We have a large, old, brick-built house house with a room on the third floor in the converted attic. The 2-unit Orbi comes with a base “Router” unit and a “Satellite” unit. You will need to connect the “Router” unit with an ethernet cable to the main router of the house. Then you can place the Satellite unit to the main living area. If you need more coverage later on you can buy one more smaller satellite unit but this might not be needed. If you go with Velop. you will still need to connect one of the Velop units with an ethernet cable to the main house router and then place another Velop unit to the main living area. So basically your setup will be the same for both Orbi and Velop. I had one more question. Do you know the difference between the Orbi RBK40, RBK50 and RBK53? thanks very much! RBK40: covers up to 4,000 square feet. This is a 2pk system and comes with 1 Router unit and 1 Satellite unit. Also, the combined WiFi speed of each unit is 2,200 Mbps (dedicated backhaul channel speed between Satellite and Router is 866 Mbps). RBK50: covers up to 5,000 square feet. This is again a 2pk system and comes with 1 Router unit and 1 Satellite unit. Also, the combined WiFi speed of each unit is 3,000 Mbps (dedicated backhaul channel speed between Satellite and Router is 1700 Mbps). RBK53: covers up to 7,500 square feet. This is a 3pk system and comes with 1 Router unit and 2 Satellite units. Also, the combined WiFi speed of each unit is 3,000 Mbps (dedicated backhaul channel speed between Satellites and Router is 1700 Mbps). In your scenario I would recommend the RBK50 and if you are still not covered you can buy one more Satellite unit. Thanks again for your helpful reply. I will try to purchase it through the link on your site, however it does take me to the US Amazon site and I am in the UK so not sure it will work!